SNH Disposal offers you the very best in affordable curbside trash pickup and ​waste recycling services in Nashua, New Hampshire and the surrounding New England area. Our mission at SNH Disposal is to help keep the environment clean and beautiful by offering reliable and dependable trash pickup and recycling services for both homeowners and businesses. If you are looking for a trash disposal and recycling company that is a step above the rest in our commitment to efficiency and affordability, we are the company for you. All of our staff are trained in customer service to ensure that your experience is a great one. Fill out the free instant quote form and a friendly customer sanitation service representative will be in touch shortly. ​Need garbage disposal service in a hurry? Call (603) 821-0146 right now. Or, use the button below for a free quote. SNH Disposal also offer both commercial and residential recycling services. We try to keep things as simple as possible when it comes to our recycling services. ​Our customers are offered either weekly or bi-weekly recyclable pickups and we even have easy-to-use carts available for single use. At SNH Disposal, our most utilized service is curbside trash pickup for both residential and business customers. Weekly trash pickup is our normal routine. 1. Eliminate the need for landfills. 2. Generate electricity from recycled waste. 3. Avoid the burning of polluting fossil fuels. 4. Help protect our small blue planet for generations to come. We also provide fast and convenient dumpster and rolloff rentals, special trash pickups and demolition debris for both residential and commercial accounts throughout the New England area. Our friendly and courteous staff will be pleased to answer your questions and work with you to satisfy your trash recycling and waste disposal needs as well as your budget. Not too many generations ago trash was literally thrown out onto the street. As you might expect, this resulted in a huge rodent and vermin problem that couldn't be contained because of trash-riddled streets. Advances in science and disease control have taught us much since then, the result being that, today we have disposal companies that make sure our trash is picked up and taken to its designated location to be recycled, burned or buried at a landfill (those born a generation or two ago might still refer to the local landfill as the "dump"). How important is recycling? Think of it this way. Our beautiful, blue planet is a lot smaller than you might realize - just 8,000 miles in diameter. And nature's resources are not unlimited. In fact, everything in nature is very much limited. Which makes it our duty as inhabitants of this wonderful home we call Earth to respect and protect nature's bounty. What is one of the most powerful and efficient ways each of us can help to accomplish this? Recycling! Our mission at SNH Disposal is to help keep our environment clean and beautiful by offering trash disposal and recycling as dependable services that are both safe for our patrons and respectful of the environment. The results of our passion for excellence include lessening landfill waste, re-purposing of useful items through recycling, the production of new raw materials out of salvaged waste products and materials such as scrap metal, wood, paper and plastic. 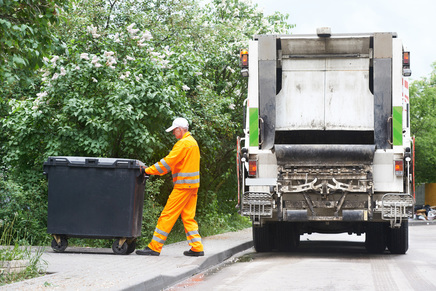 As leaders in sanitation and disposal services, we offer our clients a variety of helpful disposal, recycling and waste management services to help keep our communities clean while protecting the environment. ​We strive to be the best; to never provide anything less than top notch service ​and premium customer support. You deserve no less. Our expertise in the business of sanitation begins with professional drivers who are certified waste removal technicians. Our customer service representatives are well-informed in all areas of wast disposal and recycling, and our management team shares a common vision of a cleaner, mores sustainable environment. Our commitment is to serve our residential and commercial clients the way we would want to be served ourselves: with reliability, dignity and respect. Since our start in the disposal and recycling industry more than 25 years ago, we have served the community proudly. Trash may be junk to everyone else, but to us it's an opportunity to serve our neighborhoods by remaining a leader in sanitation. Our focus is on integrity, by consistently holding to our high standards of both professional and personal standards. Your safety is one of our paramount concerns. From required driver drug and safety testing to thorough employee background checks, a well-maintained fleet and the ability to smoothly manage emergency situations, we put our clients first. We are dedicated to giving you dependable solutions for your waste and recycling challenges, while serving commercial, industrial and residential customers coast-to-coast. If you have any questions or would like a quote, give us a call at (603) 672-4803 or fill out the form below, and we will reach out to you shortly to get your sanitation needs met.